The 35th edition of the Breeders’ Cup will be held Friday and Saturday at Churchill Downs. First post of the weekend is at 12:55 E.T. Friday, and the Breeders’ Cup Classic will be run under the lights at 5:44 p.m. E.T. Saturday. The Breeders’ Cup is 14 Grade I races (the most competitive races in North America) held over two days. It was created as a year-end championship festival of racing that could draw horses from all over, and it was first run at the now-defunct Hollywood Park in 1984. Cot Campbell, who introduced the concept of syndicated ownership of thoroughbred race horses in 1969, died Saturday in Aiken, South Carolina. He was 91. It was expanded to two days in 2007 and now rotates to a different track every year. This year, it returns to Churchill Downs, the home of the Kentucky Derby, for the first time since 2011. All the juvenile (2-year-old) races will be held on what has been dubbed “Future Stars Friday.” Consider the Saturday card the Super Bowl of the horse racing year. Saturday is when the best older horses compete in races such as the Breeders’ Cup Distaff for mares and the $6 million Breeders’ Cup Classic. The Classic, which is open to males and females 3 years old and up, is the crowning event of the weekend, and the winner of it often goes on to claim Horse of the Year honors. The Triple Crown gets most of the attention when it comes to casual viewers of the sport, but those events are restricted to 3-year-olds who mostly hail from North America. The Breeders’ Cup is the best two days of racing all year, and it features horses as young as 2 and sometimes as old as 9 among its 14 races. This is an international celebration of racing, and it has become popular with European trainers, who run their horses on grass, while North American racing runs its classic races on dirt. The 2017 edition featured a record 38 international starters, a number that has risen over the years due to the enticing purse money. The Breeders’ Cup Classic features Dubai World Cup winner Thunder Snow; four-time Group 1 winner Roaring Lion, who recently won at Royal Ascot; Mendelssohn, who has won in North America, Dubai and Ireland; and Japanese-bred Yoshida. What’s more, the 6-year-old Mind Your Biscuits is a former sprinter who is trying his hand at the longer distance of the Classic, and likely favorite Accelerate has been cleaning up races in California. But the Breeders’ Cup is about more than just the Classic. The highlight of the Breeders’ Cup Turf is the brilliant British filly Enable, who is a two-time winner of the Arc de Triomphe. The Breeders’ Cup Classic has produced an average payout of $26.67 on a $2 bet, and those numbers alone might help ease the sting of early retirements by Justify and Good Magic. Besides in a few races, there are no clear favorites. With so much talent all around, the fields are wide-open, and that makes for some interesting betting opportunities. Favorites have won 99 of 318 prior Breeders’ Cup races, which is only 31 percent. Because it’s rare to see matchups between the best North American horses and the best European horses, upsets abound. Combine that with one of the largest racing handles of the year, and there are some prime opportunities to make some money betting these races. Cigar, American Pharoah, Ghostzapper, Zenyatta — whether it’s a champion horse closing out a career or a future star of tomorrow, one thing guaranteed about the Breeders’ Cup is that it has future Hall of Fame horses all over the place. The Breeders’ Cup Mile, which is run on grass, often draws some of the best European contenders and has produced winners such as Miesque, Goldikova, Lure and Wise Dan. While the Breeders’ Cup Juvenile wasn’t always a great stepping stone to the Kentucky Derby, that has changed lately, with Nyquist, Classic Empire and Good Magic going on to do very well in the classic races the following year. The Kentucky Derby’s history at Churchill Downs is well known, but the track has provided plenty of drama in its eight previous runnings of the Breeders’ Cup. Perhaps none was so dramatic as the 2010 edition, when undefeated mare Zenyatta came within a head of finishing her career a perfect 20-for-20. That same year, 5-year-old mare Goldikova won her third straight Breeders’ Cup Mile. … In 2006, Street Sense won the Breeders’ Cup Juvenile and then became the first Juvenile winner to win the Kentucky Derby the following year. … In 2000, Tiznow gutted it out to win the first of two straight Breeders’ Cup Classics, the only horse to date to do so. … There was also the 1997 Breeders’ Cup Classic, which featured one of the best fields to enter the race. Awesome Again prevailed over Kentucky Derby winner Silver Charm, Belmont Stakes winners Touch Gold and Victory Gallop, and defending champion Skip Away. NBC Sports will air 12 of the 14 races beginning at 3 p.m. E.T. Friday and 1 p.m. Saturday, and coverage of the Breeders’ Cup Mile, Distaff, Turf and Classic will air on NBC starting at 3:30 p.m. E.T. Streaming will be available on Breederscup.com and the Breeders’ Cup app. 0: Number of Breeders’ Cup races trainer John Sadler has won in 41 tries. 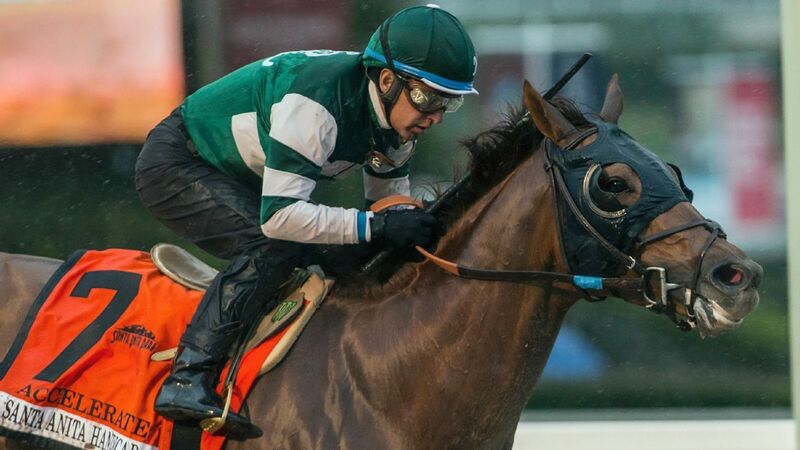 This year he’ll send out Catalina Cruiser in the Dirt Mile and Accelerate in the Breeders’ Cup Classic. 1: Horses that have swept the Triple Crown (Kentucky Derby, Preakness and Belmont) and the Breeders’ Cup Classic. American Pharoah was the only horse to have this opportunity, as the Breeders’ Cup was established after previous Triple Crown winner Affirmed retired after the 1979 season. 2018 Triple Crown winner Justify retired this summer. 13: Breeders’ Cup Classic winners, including Gun Runner last year, who have gone on to be named Horse of the Year. 18: Age of Joseph O’Brien when he won the 2011 Breeders’ Cup Turf, making him the youngest jockey to win a Breeders’ Cup race. 56: Bill Shoemaker’s age when he won the Breeders’ Cup Classic on Ferdinand, making him the oldest jockey to win a Breeders’ Cup Race. Mike Smith, 53, who has won more Breeders’ Cup races than any other jockey, has four entries this weekend. $166,077,486: Amount wagered during the two-day Breeders’ Cup at Del Mar in 2017, the highest handle since the 2010 Breeders’ Cup at Churchill Downs. $30,000,000: Total purse payouts for the entire weekend card.